There's something within me that loves seeing not-so-pretty things become beautiful, especially when I play a role in it. Seriously, I love vacuuming because I enjoy turning leave-covered rugs and dirt into well-angled vacuum lines. I love quickly picking up a room and seeing it look a million times better. And I love doing home projects to make old or worn things look oh-so-much better. Call me crazy, but there's something about it that's so satisfying. 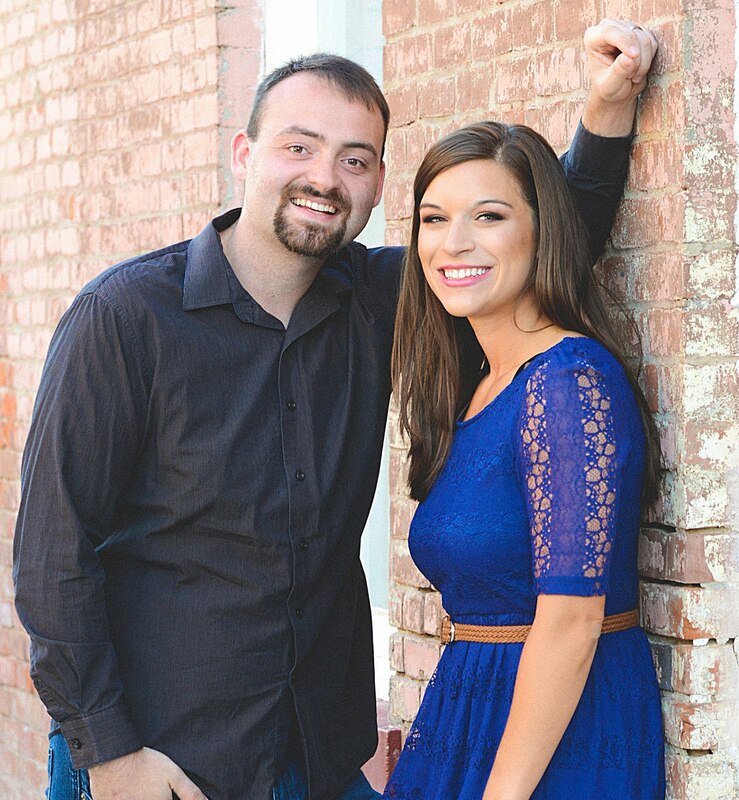 As teachers, summertime is the big time for the Kleinmeyer household to tackle home projects, especially those that involve the outdoors. I love the outdoors, and would seriously spend all of my time outside if I could. Hosting others in our home is hugely important to me, and I needed an outdoor space where I felt like I could do this. Thus, a major selling point of our house was the deck. I love the two levels, and we spend a lot of time hanging out on it, sharing meals and laughs with friends and talking until way past dark. Last year, Aaron and I spent hours and hours replacing worn boards and re-staining the pesky little slats. (Thankfully, we'd had some hail, so our insurance helped cover the cost!) I love how it turned out. We added globe lights and purchased some hanging baskets, which sat empty after I decided to throw a few extra bulb flowers in them just to see what happened. Fail. 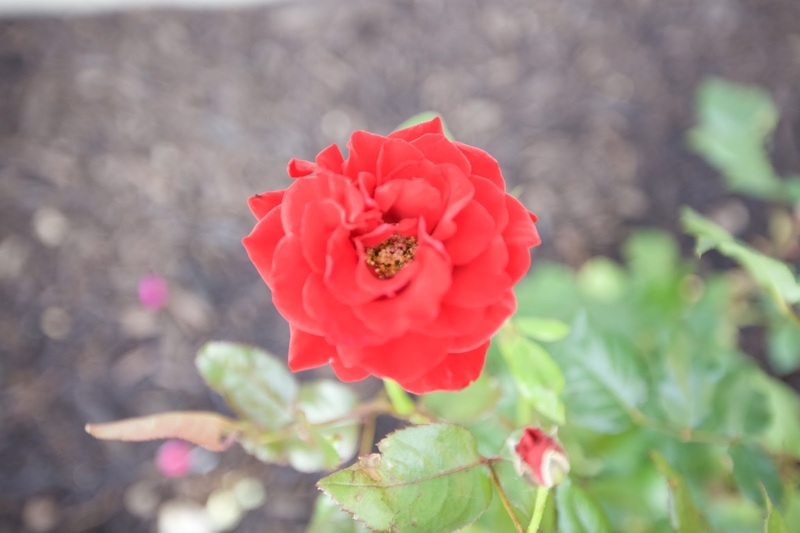 This year, in the spirit of the "learn fearlessly" part of my life mission, I've been super excited to learn more about flowers and work a bit on some landscaping on the side of our house, as well as over our deck. First, I tackled the hanging baskets. I knew that I wanted perennials, since I wanted them to come back without having to re-plant them every year. I found some pretty geranium perennials, and went for it. Transporting them into my hanging baskets wasn't hard, and I already love the way they dress up our deck. Hanging baskets and globe lights for the win. Simple things can make a big difference. 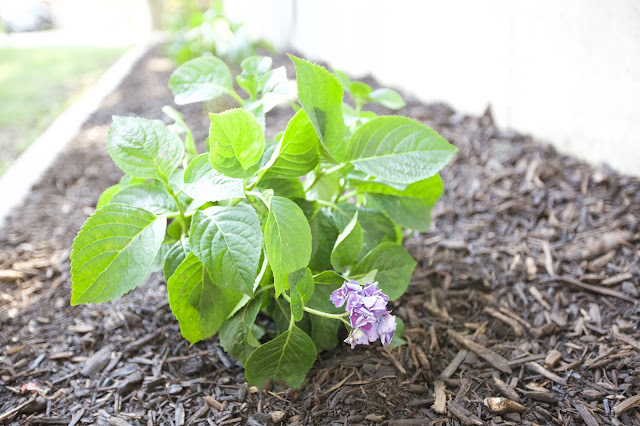 When it came to planting things in our newly-cleared out flower bed, I knew I also wanted something that would come back year after year. It's much easier on both the wallet and the schedule. (I mean, who wants to spend $40 on flowers that die after one year?) I had no shame in asking some friendly-looking ladies at Lowe's which types of roses to buy and how to prune, and at 75% off, I couldn't say no to four bushes! I'm already dreaming of fresh cut flowers in a vase on our dining room table, and Aaron won't even have to buy them. Our new landscaping. Out with the weeds and in with the beautiful. 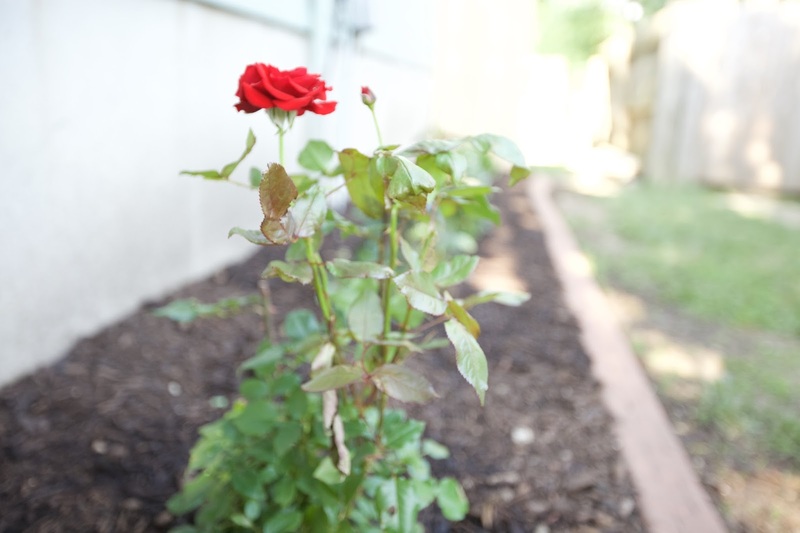 One of our first roses. We found two hot pink rosebushes that didn't need pruning, and put those on the ends, then filled in with some bushes that will produce cut roses in light pink and red. After starting our planting, we realized we need a few more plants. When we went back to Lowe's, we found two hydrangea plants on clearance. I think they're gorgeous, so we got one blue and one white. Had to grab landscape fabric and mulch to keep out all those pesky weeds. Worth it. I've found I actually love working with flowers- it's pretty peaceful and stress relieving. Hydrangeas! Found on clearance at Lowe's for $5. 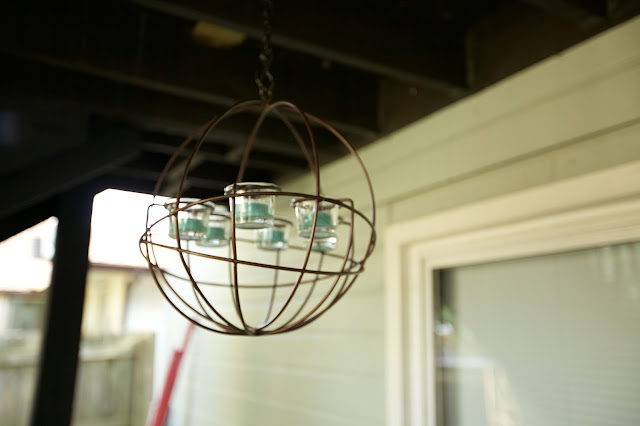 Every good deck need some awesome lighting that won't break the bank. We love the globe lights (pictured above) that we bought right when we got married. Two years in and still going strong (both us and the bulbs, people)! You can find some super reasonable lights at Target right now! For the space above our bar set, we found this nifty candle globe on sale at Home Depot. Finally, I've got some cute Mason jars with sand that I grabbed at CVS for cheap- still figuring out where to put them. All in all, I love our space and having people fill it! Globe candle votive holder. Home Depot. If you're looking to furnish your outdoor space without breaking the bank, or need to do some saving up before you buy anything else, check out how we made it possible as young homeowners. And remember, baby steps! Add one thing at a time. Shop clearance (even for flowers and outdoor decor! Flowers go on clearance simply because they don't have time to water them all and are often overstocked). If you need any help, or have any questions, comment below or contact me here. Have so much fun creating the perfect outdoor space for YOU. I'm linking up with The Crafted Sparrow, The Girl Creative, The Painted Drawer, Chic on a Shoestring, Just Us Four, The Pretty Pintistic Party, Just Another Linky, The Charm of Home, French Country Cottage, and Imparting Grace. Jordan and I will have to get some tips from y'all. Our flowers are looking pretty pathetic and our backyard is pretty much a glorified swamp! Baby steps, right? Baby steps, indeed! It takes time, so don't worry. We are almost done with year two and are still working on our back yard- I can hear sounds of saws as we speak! This is beautiful! 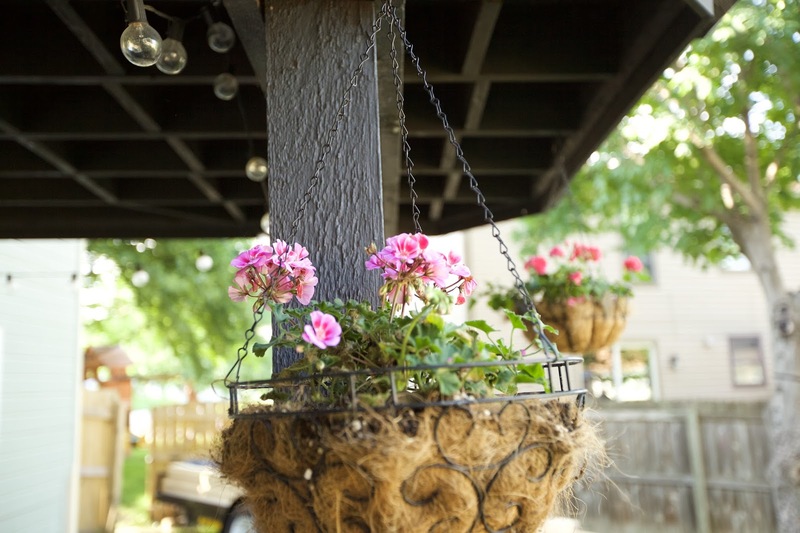 I always love buying flowers and decorating my porch with the overflowing baskets. That globe candle holder is gorgeous! It sets a relaxing vibe. Thanks so much, Mikayla! Seriously, I'm slightly obsessed with flower baskets right now. Trying to keep myself thrifty and not buy tooooo many right now. But if they are going to come back then I am totally making a justifiable investment, right? :) I love the globe too- definitely want a relaxed, homey feel to spend hours chatting with good friends. Thanks for commenting, and for reading! Thank you! I love them too (as long as I can keep them watered!). 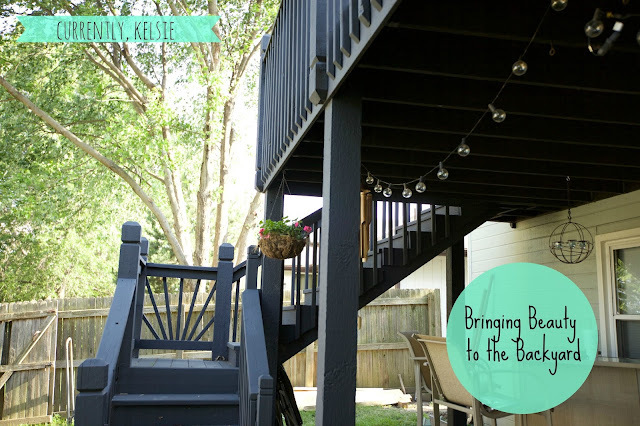 That's a great way to make your apartment "backyard" a beautiful place :) Thanks for reading and commenting! All sorts of beautiful! I dreaming of having my own backyard right now, and this doesn't help. Just have to remind myself that living in an apartment means I don't have to cut my own grass! I love your tip about shopping clearance! Living in Mississippi, I try to avoid outside time as much as possible in the hot summer, but I LOVE the mild spring and fall months. I'm hoping to score a great deal on outdoor furniture at the end of the summer. Thanks for posting, Abby! I am an avid clearance shopper. I think that we often are too impatient with shopping, when we could save so much money. Checking out the clearance rack is a huge help :) Happy shopping! Can you please come to my house and do that? It all looks lovely and you have inspired me. Sure, Sue! Live near KC? :) I promise, it's really not hard. 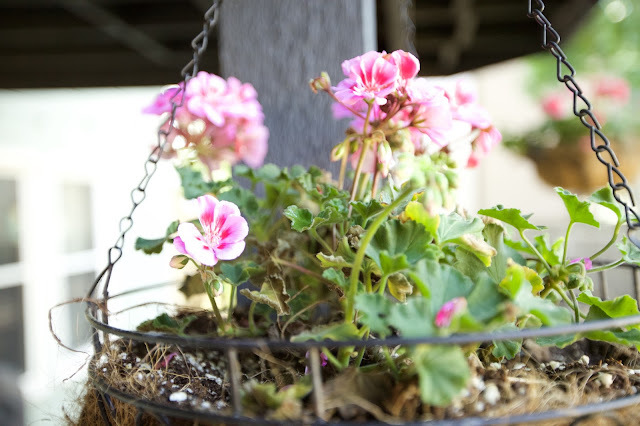 The globe lights do a lot with little work, and hanging baskets don't take super long either. Thanks for reading! Those all look great! I love plants and planting! So beautiful! I love plants and gardening! I was given a miniature rose as a housewarming gift eight years ago and it is still going strong so I can vouch for the fact they are really good value! That's amazing! I hope ours can last so long. That's a great housewarming gift- I will have to keep that in mind! Looks so pretty! Love the flowers. Thank you SO much! I'm sure you can make it happen- if you need any help, please let me know. I'm looking forward to linking up again later! Cute lantern you made! Thanks for joining Home Sweet Home! Thanks so much for having me, and for stopping by! I love your outdoor decorations! Especially in the last image. I love entertaining outside. Thanks so much, Kaley! Entertaining outside is the BEST! I love your yard! So pretty! I LOVE the fixture from Home Depot. You guys have a really lovely backyard! Looks like a fun place to spend time! What a beautiful space! We moved into our first home with a yard last summer, we didn't get the ball rolling right away with sprucing up the yard. Since it was already mid-June when we moved in, there wasn't time for as much. This year I plan to get started early!